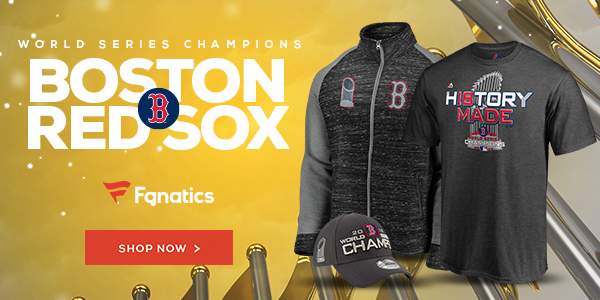 THE BOSTON RED SOX ARE WORLD SERIES CHAMPIONS! Damn, it feels great to write that. 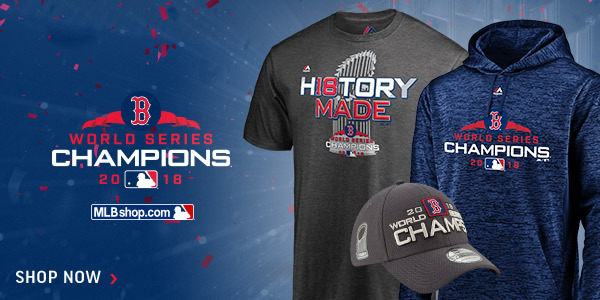 I spent the first twenty-four years of my life convinced that the Red Sox would never win a World Series and now here we are in 2018 and I've seen them win four of them. It's been an incredible run and this season may have been the most fun of all. Nothing can ever top the catharsis of 2004, the brilliance of 2007, or the healing power of 2013, but this 2018 team may have been the most thoroughly fun team of them all. Watching this team from spring training right through to the end of the World Series has been one of the most joyous and rewarding experiences I've ever had. Even better has been what this season has given me beyond the enjoyment of watching great baseball night in and night out. It's given me the opportunity to bond even more with my wife and children, an opportunity to take risks and hone my sports writing skills, the opportunity to write for Guy Boston Sports, and the opportunity to meet new fellow Red Sox fans and writers. This certainly won't be the last Red Sox related thing you'll read from me, but this will be the final recap of the 2018 season so let's get down to it. With a commanding three games to one lead in the series, the Red Sox were completely in control while the Dodgers were hanging on for dear life. Game five pitted two starting pitchers with checkered postseason histories against each other in David Price and Clayton Kershaw. While Kershaw had been roughed up in his game one start, Price was masterful in game two. From the beginning, the Red Sox were on a mission in this game and they got things started early in the first inning. Andrew Benintendi singled with one out and was followed by Steve Pearce who blasted a home run to make it 2-0 Boston after only six pitches from Kershaw. Los Angeles answered in the bottom of the inning when David Freese deposited Price's very first pitch in the right field stands to cut the lead in half. That would be all the Dodgers would do, though, as Price proceeded to mow them down over the next 7+ innings. The only spot of trouble he was in occurred in the third inning with one out when what looked to be a routine fly ball to right field from Freese was lost by JD Martinez in the twilit sky and sailed over his head for a triple. Price was able to get out of the jam unscathed with a ground out and a strikeout to end the inning. From there he cruised, going 7+ while only allowing three hits and the single run. He struck out five, walked two, and was in complete control before being lifted in the eighth. Joe Kelly and Chris Sale pitched the eighth and ninth innings, respectively, and both struck out all three of the batters they faced to end the game. In between, the Sox got insurance runs from a Mookie Betts solo homer (the first of his postseason career) in the sixth, an absolute moonshot to dead center field by JD in the seventh, and another home run from Pearce in the eighth. That was more than enough for a 5-1 series clinching win and there was no more fitting ending than to see Sale strike out that bum Manny Machado swinging down on one knee before Christian Vazquez leaped into his arms to begin the celebration. Boston outhit the Dodgers 8-3 and were ruthless and relentless in this final win. Everyone had at least one hit except for Brock Holt and Vazquez, but everyone contributed in this game, this series, and this season and for the third straight series, the Red Sox celebrated on their opponent's field. The 2018 Red Sox finished the season going 11-3 in October (4-2 at home, 7-1 on the road) with a total of 119 wins. 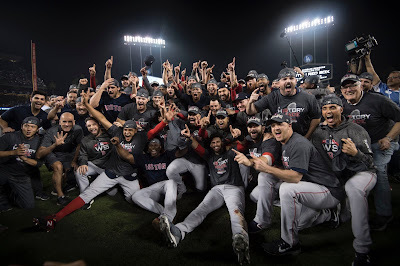 While 2004 was the most important Red Sox team of all time, I'll declare with no hesitation that the 2018 was the best Red Sox team of all time. The sheer dominance of this team from beginning to end and the vast number of ways in which they could beat you made them a juggernaut. They were deep, talented, and resilient and it all started with Alex Cora. Aside from signing JD in the offseason, hiring Cora was the single greatest move that ownership and the front office made. Except for JD this was basically the same team they've had the last two years, but the maturation of the players under Cora's leadership and the virtuosic way in which he managed the entire season cement him as one of the greatest managers this team has ever had...and after only his first season! Everyone performed great in October, from the much maligned bullpen that seemed to completely flip the regular season script to the bench guys, one of whom became World Series MVP (looking at you, Steve Pearce). Then there's perhaps the biggest redemption story of all: David Price. Price's foibles and failures in Boston and and postseason are well known, but he's all but erased them with his pitching in the ALCS and World Series. This team was carried at times by not only its superstars, but often the supporting players. For much of this World Series while Mookie, JD, and Xander Bogaerts slumped the offensive load was borne by Pearce, Mitch Moreland, Rafael Devers, Jackie Bradley, Brock Holt, and Eduardo Nunez. They got phenomenal starting pitching from Price, Rick Porcello, and Nathan Eovaldi and spent the entirety of the postseason without Chris Sale at his best. The bullpen, so inconsistent and downright bad at times during the regular season was damn near unhittable in October. Joe Kelly, Ryan Brasier, Matt Barnes, and Craig Kimbrel (after the ALCS) were automatic and contributed hugely to the team's success. From Mookie down to the 25th guy on the roster, this was truly a team accomplishment. All season when some guys were down, others guys picked them up. On and on it went, all the way to a World Series victory and after dispatching the Yankees (100 wins), Astros (103 wins), and Dodgers (92 wins), those criticisms we heard all year about how "the Red Sox only beat the bad teams" now seem pretty silly, don't they? Let's enjoy this title, Red Sox Nation; the first flushes of celebration will fade over the coming weeks, but the memories will live forever.